Hi Creative friends! 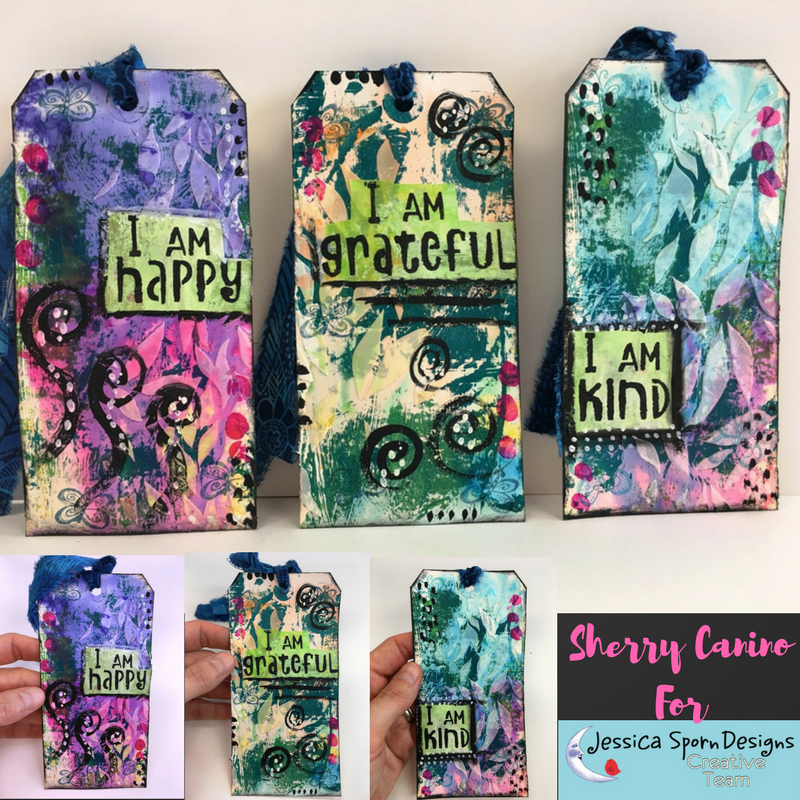 Sherry Canino here for the Jessica Sporn Designs Creative Team. For those who know me you know I just love to create tags. Tags are a fun way to make a “mini” art piece especially when you don’t have lots of time. Plus, creating tags gives me an opportunity to have something to “giveaway” (one lucky commenter will win these 3 tags details at the end of the post). 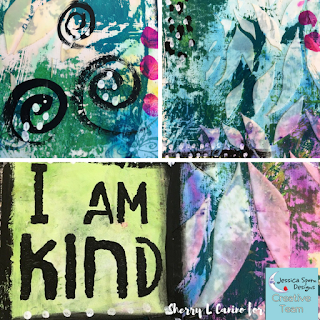 I have chosen to create some positive affirmation tags this week in my video tutorial, because we can all use some positive inspiration in our lives. So come along with me and let’s create some uplifting tags together. Share this post somewhere on social media - lets spread positive inspiration everywhere together friends!! Winner will be drawn at random. Comments close June 4th, 2017 6pm EST. Winner will be posted in the comment below on June 5th at 11am EST as well as on my personal blog and Facebook page which you can find in the links below. Good Luck friends and spread that happiness!! 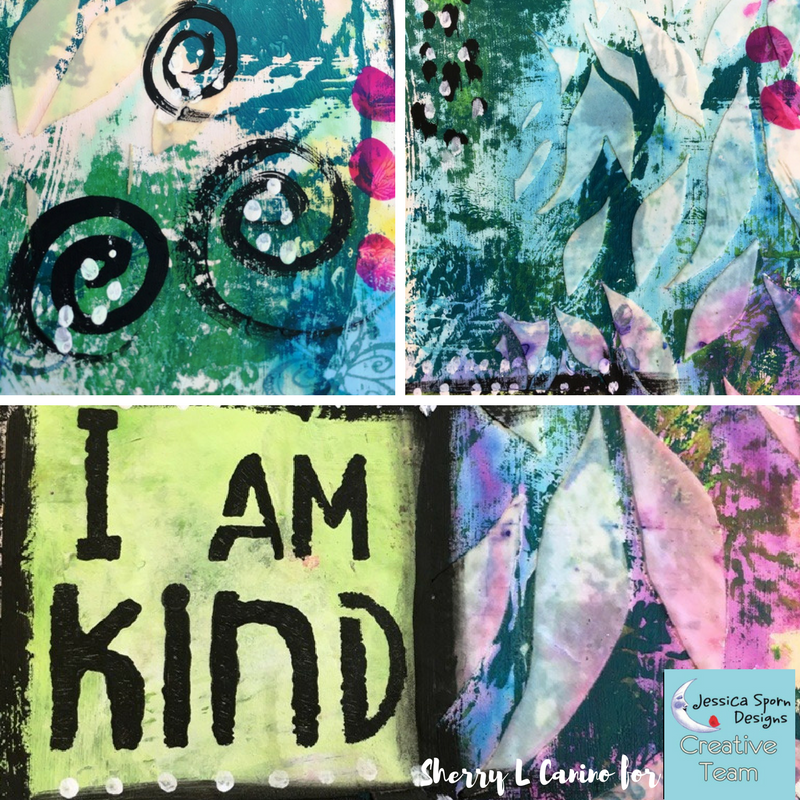 Sherry Canino, a former accountant, is a self taught mixed media artist and owner of Canino’s Artistic Café. She also works as an art therapist for a local organization. Her style is whimsical, colorful and inspirational and has been featured in Syracuse Women’s Magazine. 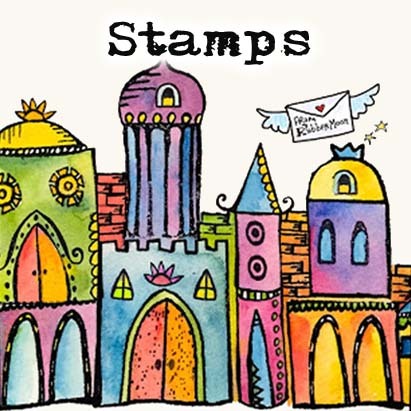 She offers local as well as private art classes in her Liverpool Studio, and art journal or art therapy classes on location for businesses and schools. 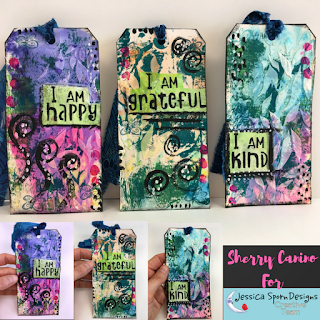 Find Sherry on Facebook , Instagram, Etsy and on her blog. THANK YOU SHERRY! To see all of the Creative Team posts, click here! Awesome Jane thanks so very much !!! Lol, just seen below.... Duh? 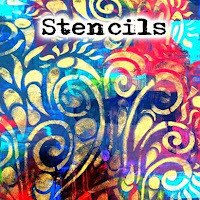 Such wonderful colors and I love your stencil use! It is always good to hear positive words! I really should be making tags more often. They're such fun little projects. Also, hi Jessica!! 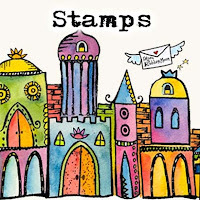 Showing you some love to as this is your blog after all <3 You really have some fabulous designs! Cool tutorial, thanks for posting it. I tried it out on some index cards for ICAD 2017 and will post my results on Instagram. I am pretty pleased! All you ladies here rock! Due to some things I have going on tomorrow I wanted to post the winner tonight. I did a random number generators - Each comment was assigned a number in order of the comment by date and Caroline You are the Winner!! Congrats!!! I will shoot you an email so you can give me your mailing address. What lovely and inspiring tags! Time for me to get out some tags and get to work!